I remember vividly my first experience with Dean's Beans. The year was 1999 and a local, progressive coffeehouse began featuring their beans due to the fact that DB believes strongly in using coffee to drive positive change. Sadly despite the altruistic mission of this local cafe, they did not care much for coffee quality and as such they closed down after a few years. After that point, Dean's Beans continued to blip on my radar here and there. I would hear of news of the company's efforts and of cafes taking up their mantle, but it wasn't until recently that I was able to truly reconnect, in my own home laboratory nonetheless. With a bag of their medium roast Peruvian arriving on my doorstep, I brewed up their beans via pourover, french press and siphon. The pourover doled out notes of chocolate, cherry, hops, biscuits, sesame seeds and cream within a medium body; tasty but a tad bitter. The french press similarly issued cream, chocolate, kale, vanilla, cherry, fig and a little hops, proving a little sweeter than the pourover. The siphon made for the smoothest brew, singing of biscuits, honey, chocolate, sesame seeds and vanilla amidst a medium body. 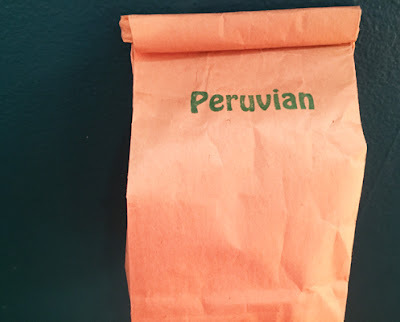 While I found the coffee overall tasty, there were a few minor elements that I would change (mostly I'd be curious of this coffee as a light roast). If you seek a flavorful Peruvian with some darker elements, give Deans' Beans Peruvian a sample.